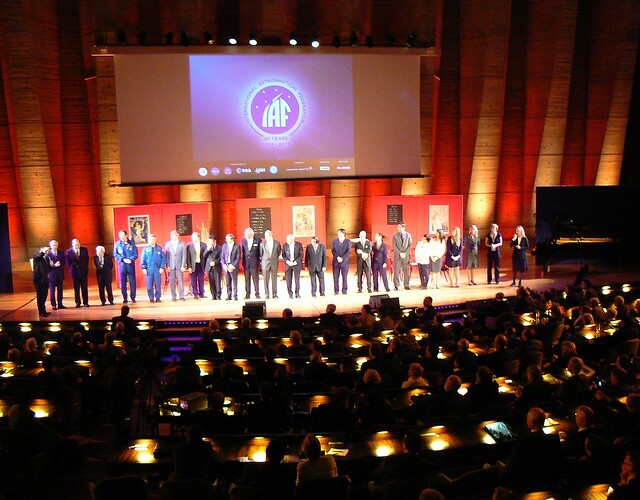 During 2011, the International Astronautical Federation is celebrating its 60th Anniversary and is honouring this occasion with a special, one-time award. IAF member organisations were eligible to nominate a project or person. The Award was set up to recognise an organisation or key individual for a singular and successful project in the field of Space Applications, Space Science and Exploration, which could demonstrate through its implementation, that measurable benefit to humanity has been achieved. The 60th Anniversary Award will be given to the Global Positioning System (GPS), nominated by IAF member, the American Institute for Aeronautics and Astronautics (AIAA). The IAF 60th Anniversary Award Ceremony was held at 16:00 on Tuesday 4 October in the IAF Cluster Forum during this years International Astronautical Congress in Cape Town, South Africa. It will consist of a certificate and a trophy. The Bureau of the International Astronautical Federation chose the recipient of the Award on the basis of a recommendation of the IAF’s Honours and Awards Committee, chaired by Sir Martin Sweeting, following the committee’s evaluation of the proposals. The Honours and Awards Committee recognised the uniqueness of the GPS programme and the exemplary role it has played in building international collaboration for the benefit of humanity. Notwithstanding the many scientific and technical achievements that have come from human and robotic spaceflight and the revolutions created by satellite communications, weather satellites, and remote sensing, GPS is the space programme that touches and aids more humans every minute of every day in every corner of the globe. The Global Positioning System is an increasingly vital part of several critical infrastructures for air transportation, maritime shipping, electrical power, communications, timing natural resources management, and emergency responders at global, national and local levels. The position, navigation, and precision timing capabilities of GPS have enabled the infusion of information technology productivity into traditional physical infrastructures in both developing and developed countries. Like an open source computer operating system, its public interface standards have enabled market-driven innovations in a wide array of applications that were not imagined by the system’s creators. The COSMO-SkyMed (Constellation of small satellites for the Mediterranean basin observation) of the Italian Space Agency (ASI), was nominated by CIRA. It is an Earth Observation satellite system funded by the Italian Ministry of Research and Ministry of Defence and conducted by ASI, intended for both military and civilian use. The space segment of the system will include four medium-sized satellites equipped with synthetic aperture radar (SAR) sensors with global coverage of the planet. Observations of an area of interest will be repeated several times a day in all-weather conditions. The imagery will be applied to defense and security assurance in Italy and other countries, seismic hazard analysis, environmental disaster monitoring, and agricultural mapping. The SHARE (Soil moisture for hydrometeorological applications) project, nominated by FFG, belongs to European Space Agency’s DUE Tiger initiative projects. With its accomplishment in providing operational soil moisture services from satellite instruments it fulfilled the main focus of the TIGER initiative to provide concrete actions by applying space technologies for water resources management. The successful finalisation of the first phase motivated further continuation of the project. The soil moisture services currently extend over three continents (Australia and portions of Africa and Argentina) and additional products are being developed to support inundation extent monitoring during flood events. Osmografo, nominated by GMV, is a revolutionary system that uses GPS and meteorological sensors to map canine rescue operations thus improving the coverage of a disaster scene. It compiles the data from satellite positioning devices and a wind gauge to build up a map of the area covered by the air-scenting dogs during their runs. The system is designed to fit in seamlessly with the search-and-rescue teams’ operations. The JAXA Solar Exploration Programme, nominated by JAXA, included Solar Sailing, performed by the IKAROS. A Solar Sail is a space yacht that gathers the energy flux for propulsion from sunlight pressure acting on a membrane. A solar sail is propelled without consuming propellant at all as long as it receives light energy from the Sun. The concept was first realized in the IKAROS mission. Secondly, the Hayabusa mission was the world’s first round trip to an extra-terrestrial object – the asteroid (25143) Itokawa. For two months, Hayabusa carried out detailed scientific observations and in the third month, it touched down three times including 30 minutes on the surface. Hayabusa returned to Earth on 13 June 2010. The Design of an Automated System for Debris Removal from the Near-Earth Space Environment, was nominated by TsNIIMASH. Launch data of several rocket types have shown that liquid rocket stages generally preserve not less than 3% of their total propellants after mission completion. A fundamental factor in the development of the autonomous de-orbiting system, developed by Omsk State Technical University, Politecnico di Milano, Delft University of Technology and the Central Scientific Research Institute for Machine Building (TsNIIMASH), is the use of these non-depleted propellants after payload separation – first venting the gasified products into space, avoiding potential future explosions of the stage which could lead to severe fragmentations and then the gas can be used for administering an accurately directed impulse, which can shift the orbit of the separated stage to a less than 25-year disposal orbit. The Dnepr Space Launch System was nominated by Yuzhnoye SDO. Yuzhnoye State Design Office, ISC Kosmotras and Yuzhny Machine-Building Plant together with cooperating space companies in Ukraine and Russia created the Dnepr space launch system. The system is built upon a converted highly reliable SS-18 intercontinental ballistic missile, which was designed, proven, and produced earlier. The Dnepr launch system is based on a decommissioned SS-18 missile adapted for payload accommodation. The system was developed in full compliance with the Strategic Offensive Reductions Treaty. The Dnepr performance capabilities allow the delivery of spacecraft weighing up to 4 tons to circular and elliptical orbits with high reliability (97%), allocating about 21 cubic metres to a payload accommodation area. Flexibility of the SS-18 ICBM, its design, high performance capabilities, high accuracy, and flight reliability made it possible to use the SS-18 as a basis for a highly efficient launch vehicle, which meets today’s requirements applied to launchers and has its share of the domestic and world launch services markets. Reiner Rummel, nominated by Thales Alenia, is currently the Principal Investigator for the high level data processing of GOCE’s data and former Head of the Institute for Astronomical and Physical Geodesy of the Technische Universität München (TUM). He has established a bridge between the user’s community and the engineers who developed the instruments and built the spacecraft. By opening up a new viewpoint of Earth observation, GOCE is advancing both science and applications. He has been the leading force in building up a space geodetic community in Europe, both through his work in the advisory structures of ESA and through his teaching; the people who obtained their PhD with him are among the foremost practitioners of the field of physical geodesy in Europe today. Dr Mustapha Masmoudi, nominated by ATUCOM, has been Chairman of Tunisian Communication Association and space sciences ATUCOM since 1985 and has been a permanant member of International Astronautical Academy IAA since 1995, being a member of the Trustee (Social Sciences Section) of the IAA. He has been very active in the development of space assets in his own country and further afield. He founded and became the first chairman of the Tunisian Space Commission in 1984 and was a Tunisian member of parliament between 1986 and 1994. He was Chair of the intergovernmental conference on communication development (DEVCOM) and was co-founder of the mechanism adopted in this conference (PIDC). He was formerly Chairman of Council of Ministries of Information of Non-Aligned States (1976-1978) and has been a member of the African Steering Committee NGO for the preparation of WSIS since 2002. Prof. Ernesto Vallerani, nominated by Thales Alenia, actively supported the Italian participation in the International Space Station through initiatives such as the Logistics Modules MLPM, developed in Thales Alenia Space in a unique bilateral venture NASA-ASI, which promoted TAS into the role of leader in the design, construction and operation of pressurized manned elements of unique technoligical characteristics. While leading TAS growing through international allienace in Europe and in the US, Prof. Vallerani also devoted his energy and knowledge to support educational programmes throughout Europe.